If these Chocolate Kiss Cookies look rich, they are. 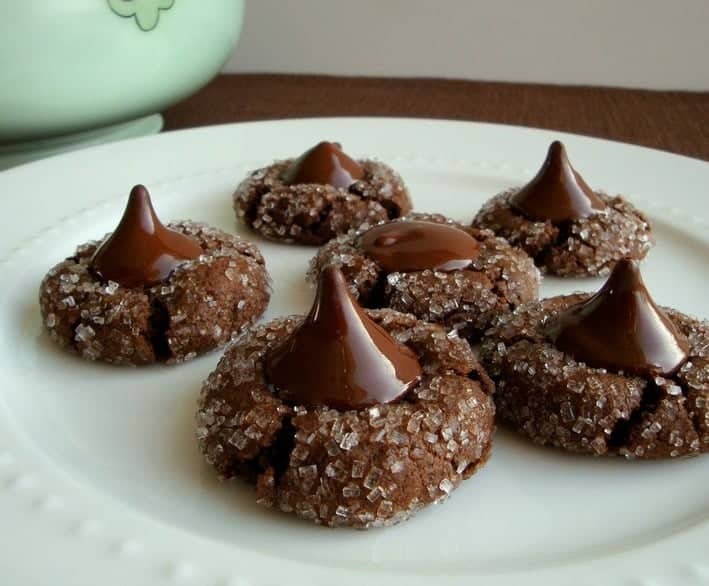 If these Chocolate Kiss Cookies look delicious…. they are! I’ve tried many chocolate cookie recipes searching for one that was moist on the inside with the right amount of chewy outside. Almost like rich, decadent brownies. Finally, these cookies are the ticket. Using plain Greek yogurt as a key ingredient seems to do the trick for creating the moist, chewy balance. Plus, the recipe is not overly sweet, which let’s the chocolate flavor reign. Use any type of sugar you like for these cookies. Decorating sugar, sanding sugar, turbinado sugar OR leave them naked. It’s all good. 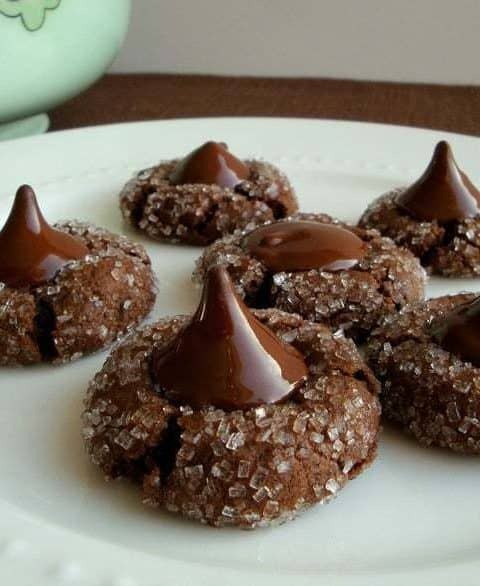 The Kisses will melt a bit after they’re placed on the cookies. Try not to move them until they’ve cooled completely or you’ll get a few flopped tops like I did. But really? You’ll eat those too. 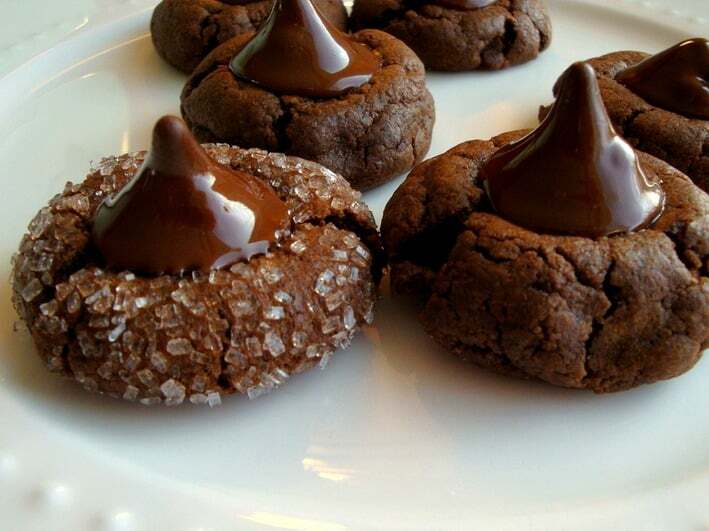 Top these cookies with any type of Hershey's Kiss you want, depending on the season. These are chewy-good and rich. Preheat oven to 350 F degrees. Unwrap Hershey's Kisses and set aside. In a large bowl, beat butter, white sugar, and brown sugar until fluffy. Add the Greek yogurt and egg and beat until smooth. In a medium bowl, whisk flour, cocoa powder and baking soda. Stir flour mixture into butter mixture until just incorporated. Using tablespoonfuls of dough, gently roll cookies into balls and roll in sugar. 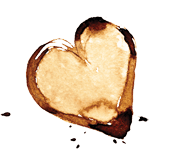 Place 2 inches apart onto parchment lined baking sheet. Bake for 8 minutes. Remove from oven and let cool for 1-2 minutes, then place Hershey's Kiss on top, pressing down gently. Do not move the cookies until they are completely cool and the kiss has a chance to set back up (or your little kiss top might flop). Store cooled cookies in airtight container. Original recipe from Inside BruCrew Life. The recipe says to add salt with the flour, but there is no quantity of salt listed in the ingredients. I looked at the original recipe and they didn’t list any salt, so I guess I will just leave it out of mine. Is there supposed to be salt in these cookies? Hi Lise, Sorry about that. There is not salt in this recipe. I have since corrected the copy. Thanks for the heads up!